Undoubtedly, the most noteworthy building inside Agra Fort is the Jahangir Mahal (Jahangir's Palace), which was the principal zenana palace (palace for women belonging to the royal household), used mainly by the Rajput wives of Akbar. A splendid gateway leads to an interior courtyard surrounded by grand halls covered with profuse carvings on stone, heavily fashioned brackets, piers, and crossbeams. One can still spot remnants of decoration in gold and blue done in the prevalent Persian style. Jahangiri Mahal mixes Transoxanian (Central Asian) features, such as the verandah on the east front with its high slender columns (a translation into stone of the timber iwan of vernacular Transoxanian architecture), with courtyard halls styled in the broader Gujarat-Malwa-Rajasthan tradition as it had been passed onto the Mughals by the early 16th-century architecture of Raja Man Singh of Gwalior. This exotic medley and adventurous eclecticism suggests a daring approach in architecture. The typically Gujarati brackets-fabulously carved animal and floral motifs-register a dominating effect on the few Islamic features such as the verandah on the eastern front with exquisitely slender pillars facing the riverfront. 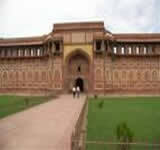 Jahangiri Mahal is the most important building of the Akbari period in the Agra Fort.